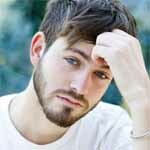 The particulars may vary from one man to the next, but the reasons men withdraw emotionally usually fall under a few main umbrella categories, which we’ll discuss. Most of the time, men withdraw because they need to work something out internally and this is just the way they do it. We’ve all heard about the metaphorical “man cave,” but knowing about something doesn’t always mean you understand it. Other times, he just doesn’t like you enough, or something about the relationship is troubling him. Maybe it’s moving too fast, maybe he’s having doubts, maybe he has some commitment-issues that are being activated. Obsessing over why he’s withdrawing only makes things worse and pushes him further away. 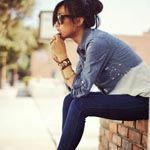 Women have a tough time understanding why men need to withdraw in order to deal with uncomfortable emotions because most women are comfortable navigating through murky emotional waters. Most women aren’t ashamed of their emotions, and they don’t hesitate to reach out to others for comfort and support. Most men just don’t have the same level of experience when it comes to handling emotions, and there’s more of a stigma against a man who can’t handle his emotions. Now let’s take a closer look at some of those main umbrella categories as to why men withdraw. Maybe he found incompatibilities, maybe he found someone else, maybe he decided you’re not what he’s looking for, or maybe he just was never that into you to begin with (ouch, I know that one can sting). A lot of the time we project our own feelings onto someone else. We like him so much and assume/hope/delude ourselves into believing he feels the same. Then you wonder why he went from being super into you to not so into you. He may have cared about you, he may have been attracted to you, he may have enjoyed spending time with you, but he wasn’t into you enough to want to be with you. This is the scenario we’re all kind of hoping for, right? And sometimes it is the case. Like I said earlier, most men withdraw into their “man cave” when dealing with issues. Men need space to work out their emotions, this is a private, internal process. Once he gets a handle on whatever is going on, he’ll be back and better than ever. What looks like him pulling away is often just him on a one-track mission. Most men aren’t the best at multi-tasking, men tend to focus on one thing at a time. And there are evolutionary reasons behind this. Once upon a time before Whole Foods, men needed to go out and hunt if they wanted to eat, and getting distracted and focusing on something else could get him eaten by a lion. Guys go into a sort of “shut down” mode when they’re upset. This is why they go silent. Part of this is out of consideration for you. He doesn’t want to snap at you or lash at out you or cause you to be upset with him, and this is likely to happen when he’s in an emotionally charged state. When he’s emotionally thrown off balance, he needs space to work through it on his own. And it’s important to realize that the things that upset men may not necessarily be things that would upset a woman. A man’s source of stress can come from external sources or internal ones. External stresses could be his job or his financial situation. Maybe his boss is giving him a hard time or a big deal fell through or he lost a lot of money in the stock market. Men derive a lot of their sense of worth from their ability to succeed and achieve so when a man is “failing” in these areas it can be really hard on him. Internal sources of stress are emotionally rooted and don’t always have a clear external source. He could be feeling depressed, anxious, overwhelmed, sad, frustrated. Whatever the case, he is experiencing difficult emotions and is having a hard time navigating. When this happens, he will want to hide away until he has sorted things out. At the core, men are upset when they feel like they’re losing. “Losing” for a man isn’t just direct (like their company softball team lost a game). Losing can be that their political party is losing ground, their sports team lost, their contributions were marginalized at work, etc. A man’s world revolves around whether he feels like a winner or loser in the world and in living out his overall mission/purpose. It’s also possible that he has some relationship issues. Maybe he’s been hurt in the past, maybe he has some fears when it comes to commitment. It may have nothing to do with you, just internal stuff he needs to work on. This can be a variety of things, but most likely, he feels pressured, or maybe he feels like you’re trying to rush the relationship and things are moving too fast. Acting like you’re in a relationship will not get you a relationship. He’ll start pulling away even more as a knee-jerk reaction. This isn’t a guy thing, this is just how much people respond when someone is trying to get something out of them. 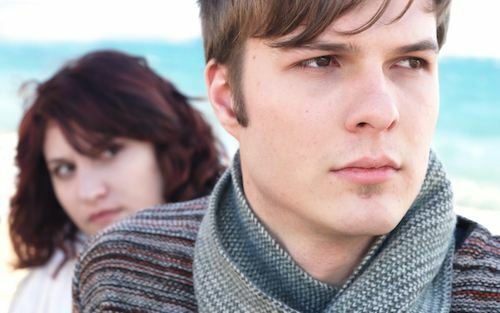 Pressuring a guy and moving too fast often stems from being emotionally needy. How this can manifest is a woman becomes desperate for a guy to commit and give her a relationship title, but the reason she wants it so badly is for the validation, it’s in order to feel good enough and worthy of love. Neediness is a huge problem and can be a major turnoff for pretty much all men. You must shed the needy mindset, this will not only help your relationship, it will enhance your life overall. This is how to be ready for a relationship. It comes down to being totally OK with however someone is acting toward you. It’s about being secure in yourself and not needing to get that sense of security from someone else. Don’t obsess, don’t take it personally, don’t chase after him, don’t beg him, badger him, guilt him, shame him, blame him. Just leave it alone. It seems counterintuitive … you want to reel him back so you spend time analyzing what you can do differently, how you can win him back and get him interested again. This can lead to chasing after him…which makes him run further away. The way to get him back is really to just do nothing. Don’t be thirsty. What does it mean to be thirsty? Thisty= Thinking you’ll be happy if only you could have a relationship and be loved. 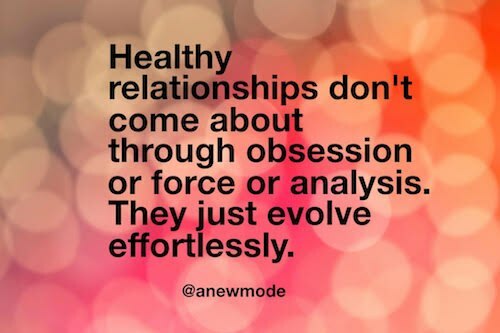 You’re so attached to this idea that finding a relationship becomes your main goal in life, it’s your focus to the exclusion of everything else in your life. You feel like you won’t be OK until you have a relationship. You worry about what it will mean if you stay single. When you’re thirsty to have a relationship/love, and get excited by the prospect of having someone to fill that role, you build up a fantasy bubble and don’t want it to burst. The tone of the relationship shifts from ease to pressure. You’re not able to be fully present with the other person because you’re consumed with the fear of losing this person. It feels like you’re putting a ton of attention and effort into the relationship, but all you’re really doing is feeding your own fears…and this, in turn, damages the relationship and causes him to withdraw. What Should You Do When He’s Pulling Away? There are a few things you should do when a man is pulling away that can save your relationship and actually make it better and stronger than ever. 1. Back off and give him space. I know I said there are things you can do, but really, you don’t need to do anything. I understand that this is easier said than done. It can almost feel counterintuitive because our instinct is to keep things we love close. Your instinct may be to chase after him, to figure out exactly what’s going on and solve it stat. What you need to remember is if he wants space, he’s going to take it no matter what, even if that means ignoring your calls completely. You only push him further away when you chase after him. Stop wasting your time trying to figure out how he’s feeling and what’s going on and what you should do about it. Spend that time literally doing anything else, anything. Worrying how he feels makes the situation worse. Not stressing about how he feels is what solves everything. Don’t feed into negative thinking. Work on feeling OK, work on your inner OK-ness. You don’t need a guy to respond to you in a certain way in order to feel OK. The choice is yours. You can feed into negativity or be happy, but you can’t have both. Focus on finding happiness and fulfillment in your life that is not dependent on another person. Men want a happy woman. Take ownership of your happiness, don’t put the responsibility on him. As we mentioned, men prefer to retreat and deal with things on their own. The biggest mistake a woman can make when he is in this mode is to force him to talk about it. And even worse is when she tries to solve the problem for him. Even though your intentions are pure, when you offer up solutions he will just feel resentful toward you. Men need to feel competent, like they can deal with whatever comes up in their lives. When you encroach upon him and try to save the day, the message it sends is that you don’t think he’s “manly” enough to deal with issue on his own, and this just makes him feel even worse. When he is under stress, just give him space and try not to take it personally. If you get angry or frustrated with him, he will just see you as another source of stress in his life, and it will put more strain on the relationship. 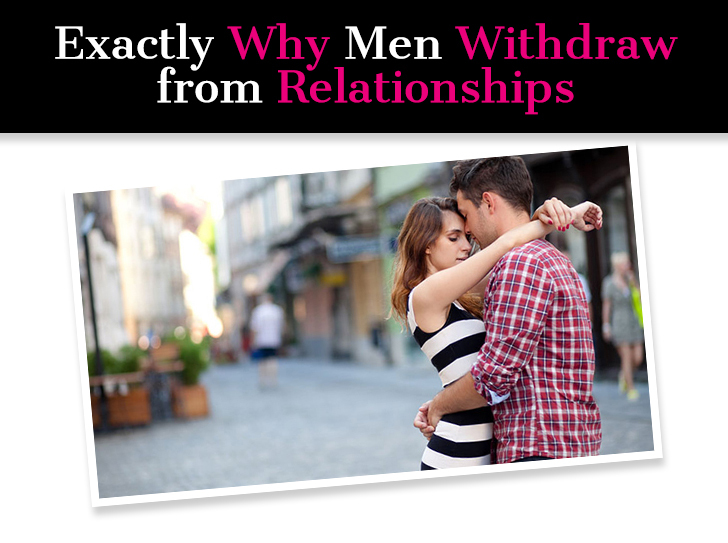 Now there you have it, the exact reasons why men withdraw and what you can do to bring him back. The only exception is if he was never that into you in the first place… if this is the case then it’s best to just let him go. You can’t force someone to want to be with you. All you can do is work on being your best self and bring that to the table. We’re supposed to meet up tomorrow to talk in person. thank you for this, it reminded me not to speculate and climb into my head. Ohhh! Interesting! I have a question though… I’ve noticed a guy I’m interested in pulling away, sort of. I’m not sure if perhaps I was doing one of those things listed, or if his life was just getting in the way. He mentioned a ton of family obligations and a second job, but after three months of not seeing him in person, it started to feel like excuses to me. I never told him I felt like that, of course, as it sounded insecure on my part. We still talk daily, though, and still flirt, it just felt like less than before, especially with not seeing him in person. I’m the type that likes to care for others, all my male friends know this and love it about me. Anyone in my inner circle that tells me a problem they’re having knows I’ve got sympathy and advice if they want it. Perhaps my advice is emasculating for him, like you mentioned? I can’t say I’ve ever had that complaint before. I do know he planned to visit his dying relative a few weeks ago, and I saw how hard it was hitting him and offered to go with him as moral support… and he took that the wrong way. He shut me down and said it’s a family matter and he will handle it himself. I know he’s been burned by women in the past, so I simply reminded him that my motives were pure. He apologized, but it just felt weird, and he made me feel “needy” just for wanting to help. Like I was pushing to make it a date, or some other motive, when I wasn’t. I go above and beyond for my friends. You haven’t seen him in person in 3 months?? That;s a major sign you’re not a priority to him and he doesn’t want a relationship with you. Don’t focus on the flirting and the banter… look at the big picture. Thank you for this article. My boyfriend of 1 year recently asked for a “break” because he was feeling overwhelmed trying to juggle his study, work and our relationship. Things were going great before that and although it hurt me when he asked for space and said that he wasn’t sure whether he could be in a relationship at the moment instead of begging for him to stay or trying to pressure him I said to him that I’ll give him the space he needs. It’s now been 4 days and I haven’t heard from him nor have I tried to reach out. I will leave him until he’s ready to talk and if never contacts me at least I’ll get the answer I need that he’s not the right guy for me. I’ve been working on myself and being happy with this situation knowing that either he’ll come back or it will be over and whatever the outcome, I’ll be ok. I encourage all other ladies who are going through a similar situation to take the advice in this article. You need to be ok with being without someone and as much as it hurts it’s important to remain calm and confident in this situation; panicking and pestering him will 100% be counterproductive. It’s taken me a long time and other past relationships where I’ve had complete meltdowns to realise this is the best way to be.